Each Sunday we gather at 10:00 a.m. for worship. 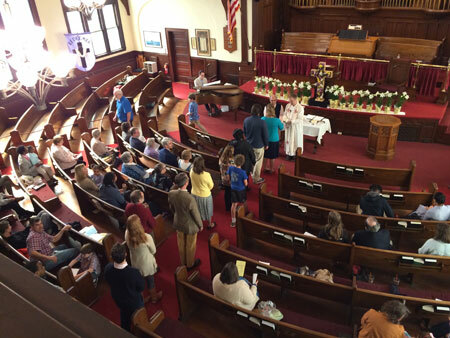 The first Sunday of each month, our worship service includes the celebration of communion. Through worship, we proclaim and give thanks to God as made known to us in Jesus Christ. Participation in worship reminds us of our identities as Christians as we support one another. Grounded in worship, our life together calls us in from the world and sends us back out into the world, renewed and eager to do God’s will. This sense of a calling to service has led us to establish the Roslindale Food Pantry, and to open our doors for important community gatherings such as Alcoholics Anonymous (AA) and RISE (Roslindale IS for Everyone). We strive to be community-engaged and socially-conscious disciples who provide witness to our Christian values of inclusiveness and welcome, justice and compassion, fairness and respect for service to the common good.